Kurzweil Technologies, Inc. (KTI) is a research and development company developing and marketing technologies in pattern recognition, artificial intelligence, evolutionary algorithms, signal processing, simulation of natural processes, and related areas. The principals of KTI have founded, developed, and sold four successful companies in artificial intelligence technologies. Kurzweil "firsts" include the first omni-font optical character recognition (OCR), the first CCD flat-bed scanner, the first text-to-speech synthesizer, the first print-to-speech reading machine for the blind, the first music synthesizer capable of recreating the sounds of the grand piano and other orchestral instruments, the first commercially marketed large vocabulary speech recognition, and others. 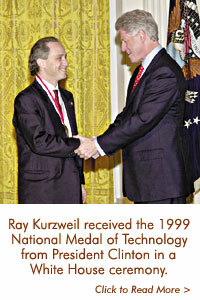 © Kurzweil Technologies, Inc. All Rights Reserved.